"When the going gets tough, the tough go shopping!" 'Troop Beverly Hills' is a 1989 comedy starring Shelley Long and Craig T. Nelson, young Tori Spelling, and directed by Jeff Kanew. Phyllis Nefler is a disillusioned and bored Beverly Hills wife and mother, separated from her rich husband, Fred, the owner of a lucrative auto shop franchise. Fred is convinced Phyllis is shallow and materialistic. To prove him wrong, Phyllis decides to start leading her daughter Hanna's troop of Wilderness Girls. Phyllis is not a wilderness type and opts instead to teach the girls tips for surviving the “wilds of Beverly Hills.” She creates new merit badges and employs irreverent ways to show her little charges how much she cares for them, inadvertently becoming surrogate parent and confidant to the girls, many of whose parents are as rich and self-absorbed as Phyllis once was. Over time, Phyllis comes to realize friendship trumps money, even winning compliments and an acknowledgment of her personal evolution from her estranged husband. Secretly Phyllis coddles the hope they will get back together, despite that her husband quickly finds a new girlfriend. Phyllis' nontraditional wilderness survival techniques quickly rub other troop leaders the wrong way, namely Velda Plendor, an old fashioned outdoorsy type who drivers her troop like a platoon. Velda rejects Phyllis' prissy merit badges and dispatches a spy, her assistant troop leader, Annie, to investigate Troop Beverly Hills. Phyllis is on edge, stressed about the fact Troop Beverly Hills is not yet recognized by the regional Wilderness Girls council. To win recognition, the Troop must pass a barrage of tests during a fast-approaching Jamboree. First, the troop must sell a certain number of cookies to qualify for the Jamboree. Phyllis throws a Beverly Hills-style star-studded party, and her troop sells 4,000 boxes. She then leads her troop through a series of wilderness scenarios, overcoming a plethora of challenges but ultimately enjoying victory. 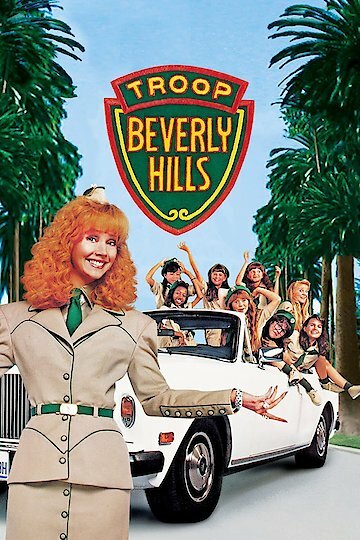 Troop Beverly Hills is currently available to watch and stream, buy on demand at Amazon, Vudu, Google Play, FandangoNow, iTunes, YouTube VOD online.